March was a great month within Truth in Nature. We continue to be blessed with young men from fatherless homes and awesome mentors to spend time with each other in His Creation during our programs. Each of our chapters held programs for boys this month. Our Dallas, GA Chapter held a “Bench Mark” Program led by Program Director Don Brooks. This was an overnight program where boys and mentors shared, bonded, and built benches on the camp property to be used as prayer benches for graduating seniors and any mentor or boy who needs some quiet time to reflect and pray. We had some great discussion time on the current events in the country with school shootings being the hot topic. We talked about how God and His Word is where you find your truth and broke into small groups where each boy had the opportunity to share in more detail. In Columbia, SC they held a construction style program as well, called Building Bridges, led by Program Director Rick Hall. These boys and mentors built a bridge across a section of the property pond on Saturday. This was an overnight program at our camp facility in Elgin, SC. We had a great man time discussion around the camp fire and after completing the bridge we learned that God is the foundation, the planks represent our walk with Christ, the uprights represent those that come alongside you to help you through. Lastly, the rope represents the tools to use to guide you. Over at our Bush, LA Chapter Program Director Ronnie Alpha took two boys, Riley and Kameron, along with mentor Daniel Lombardo on a Bonus Trip, to catch some red fish. These two young men had earned their way on this trip for excelling the previous year. This was an overnight out of our camp facility in Bush, LA and was a great night with some man time around the camp fire and a devotional on God’s Provision. Saturday the fishing started out slow but it got heated up as the day went on and the boys and mentors made some memories to last a lifetime. 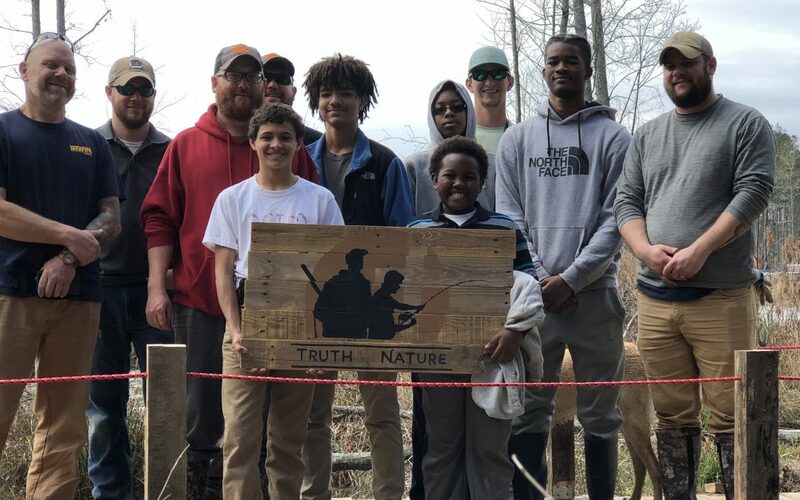 In addition to our programs Truth in Nature Bush, LA competed in the Annual Gulf Coast Bank Community Rewards Program while our Columbia, SC Chapter participated in the Palmetto Sportsman Classic. Both of these opportunities allowed us to gain exposure and raise valuable funding for our programs in these communities. Thank you all who participated in these programs and events. This month we also introduced Cory Bowes and Jim Duflo who will be opening chapters by Summer 2018 in Apex, NC (Cory) and Newberry, MI (Jim) to work with fatherless and single parent boys in those communities. Secondly we announced that Michael Rivers is now moving in to a Regional Director Role within Truth in Nature while Ronnie Alpha is taking over Program Director duties in Bush, LA. Join us in thanking these men for their commitment to Truth in Nature and the boys we work with. Please continue to keep all of our programs, leaders, and most of all young men in your prayers as we seek to Reach, Inspire, Support, and Engage them with the good news of Jesus Christ while spending time in His Creation. Stay up to date with everything Truth in Nature via our Website, Facebook, Twitter, or Instagram avenues or if you would like to help continue to make this a free resource for fatherless & single parent boys you can by visiting our Donate Page.